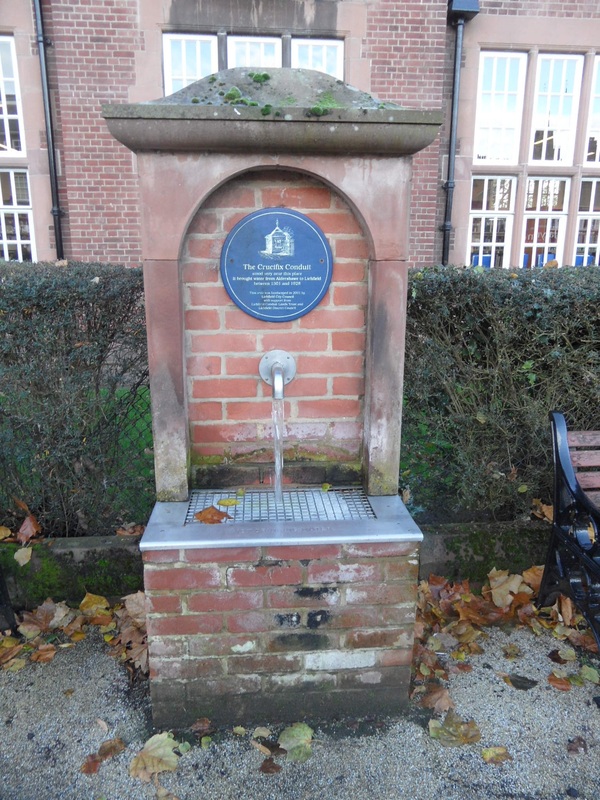 Recently, twelve year old Lily made a very interesting discovery in Lichfield. Here’s her account of how the contents of a cardboard box found in an old gaol cell turned out to be far more exciting than than anyone could have imagined…. “In November 2014, I went to the Lichfield Gaol Cells in the Guildhall. It was a Lichfield Discovered event, and we were going to look and see if we could find any graffiti, names, or dates on the gaol cell doors. About 7 or 8 of us came to the event all in all, I came with my Dad. Everyone else managed to find lots of writing and names on the doors, I didn’t find much. Near the end of the session, we were looking inside the third jail cell, the one that is not normally open to the public. My Dad pointed out 2 boxes of old looking tiles on the floor, we took a quick look, but we didn’t pay much attention to them. The next time we came to the gaol cells was on 21st February, we had come back to see if there was any more graffiti that we had missed, also to take a second look at the boxes of tiles (Jo at the museum said it was ok). This time I had come with my Mom and there was around 8 people that turned up this time. Me and my Mom started looking through the tiles, we had picked about 5 up and we laid them on a chair to photograph them, but they werereally dusty so we couldn’t see if there were any other patterns on them. There were so many tiles that we couldn’t fit any more on, we decided to move all of the tiles into the 4th cell, onto a wooden bed that the prisoners used to sleep in, (personally I would NEVER think of sleeping on one of them). We started taking some more tiles out of the box and moving them onto the bed. We moved them a few at a time, because the box was too heavy to lift. I had realised that there were a few tiles with the same pattern on. I really wanted to get a better look at what the patterns looked like, so my mom went to Wilko (just up the road) to buy 2 paintbrushes. When she got back we started brushing off the dust and dirt from the tiles we had got out, we could see the patterns a lot clearer. 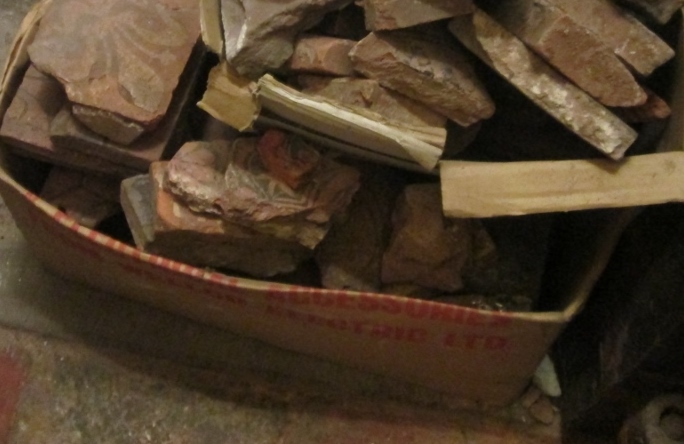 We had nearly finished emptying out the first box of tiles, and at the bottom my Mom found a bit of tile with ‘Lichfield Friary’ written on the back. She showed it to Kate and she said “Maybe it came from the old Friary!” and then we all got really excited! 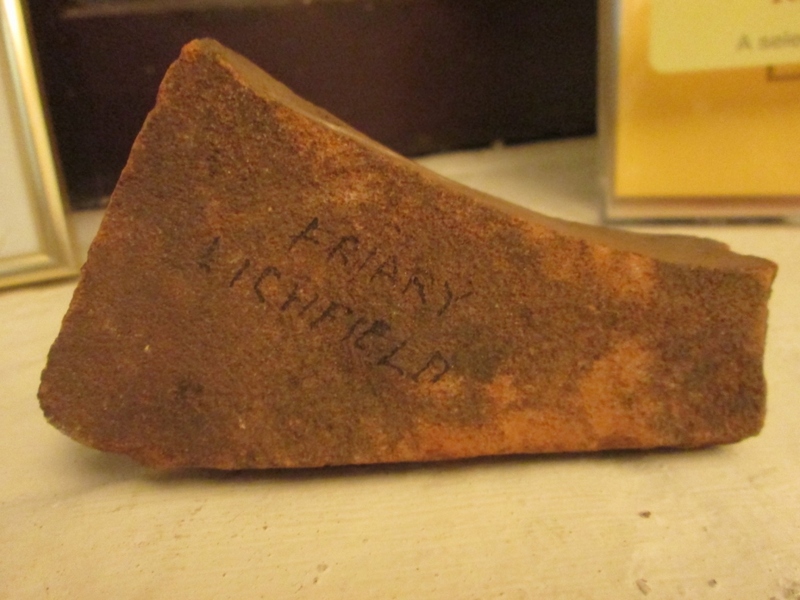 We had found lots of bone shaped tiles that were exactly like the one that said ‘Lichfield Friary’ on it. Whatever the floor was, it was really big. 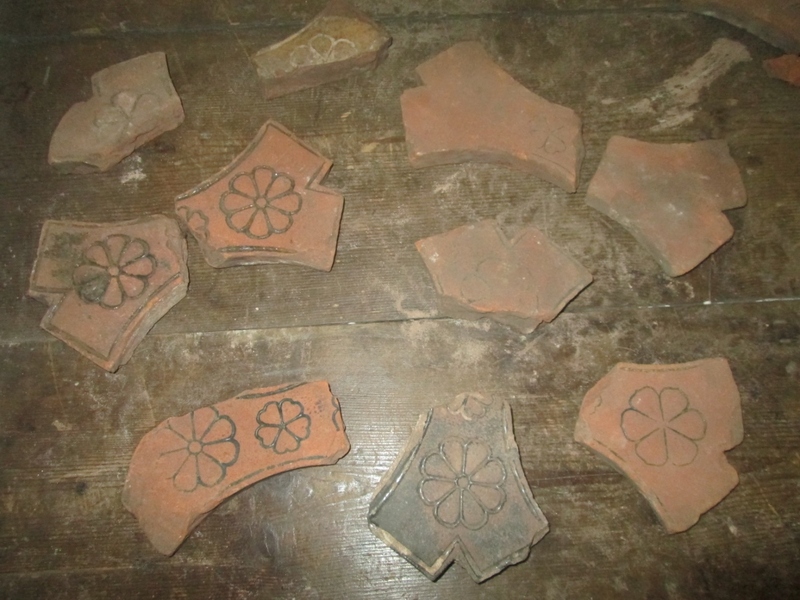 We had found LOADS of tiles that looked the same, and maybe they belonged to the same floor. I started trying to see if any of the tiles might fit together, there were loads of circular tiles, some with patterns on, and some without. 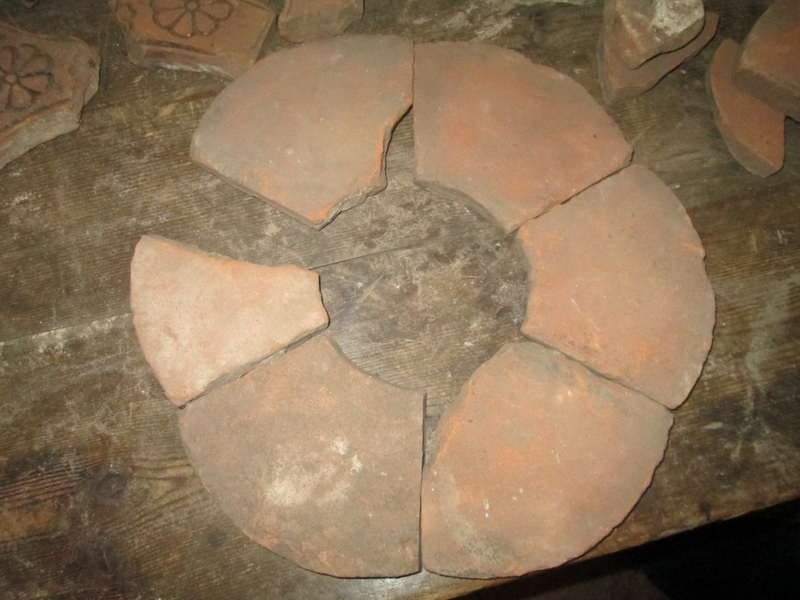 There was one round tile, with a triangle and circles intertwined in a pattern. There were also pizza shaped tiles, without a tip, like someone had taken a pizza and cut the middle out with a cookie cutter, if you get what I mean. Those tiles had a kind of moon, with a starfish shape in the middle. We had found one of these tiles that was complete and one that was broken, but fitted back together again. All the rest were broken, but I managed to get a full circle out of the fragments we had found. It was like a massive jigsaw-puzzle, but I did it in the end, and what was even more exciting, was that the circular tile fit perfectly inside the ring of pizza shaped tiles! Same with the tiles with no pattern on, but we didn’t find another circular tile. There was also another set of tiles. We had found about 8-10 of the same type, they were square, and they all had the same pattern on, the kind that can make 2 different types of patterns, depending on which way you put them. Most of them were complete, apart from 3-4 of them which we only had corners of. I put them together, and they nearly made a 9 square pattern. 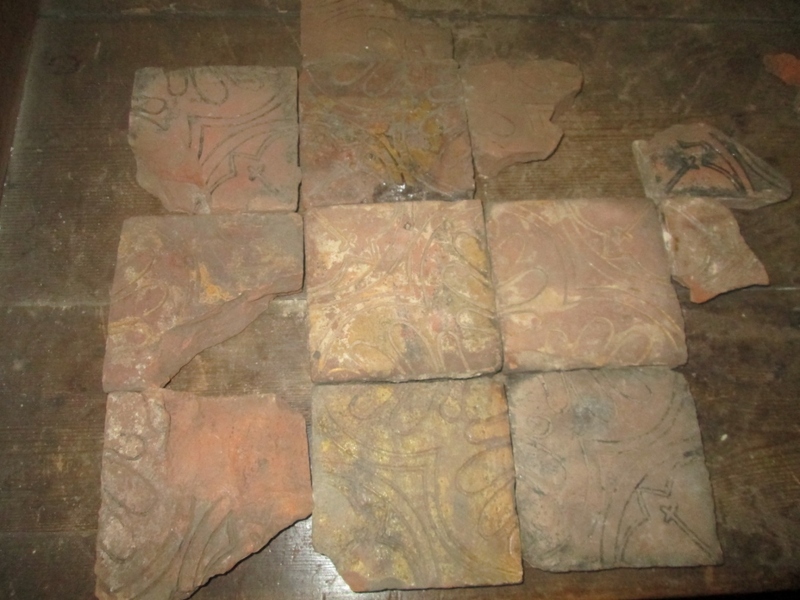 These were my favourite tiles, and I hoped we found some more of them, we only had half a box or so left to get out. We did find a couple more of these tiles eventually. We finished emptying out the box, and then we started taking pictures of all the tiles. There wasn’t much time left, so we took all of the photos really quickly. As a result, not many of the pictures were very good. And the light was quite dim in the cells, so the light wasn’t the best either. It was nearing the end of the session, so we had to put all of the tiles back in the boxes. I couldn’t help thinking that the tiles were from the old medieval Friary. At least some of them. Kate asked me if I could do some research to see if the tiles were from the Friary, Me and my Mom went to the Lichfield Records Office, to go and look at ‘The Lichfield Friary’ by P. Laithwaite, which was reprinted from the Transactions of the Birmingham Archaeological Society where a report of Councillor T. Moseley’s findings from his exploration of the site in 1933 was given. There were only 6 pages in the book. 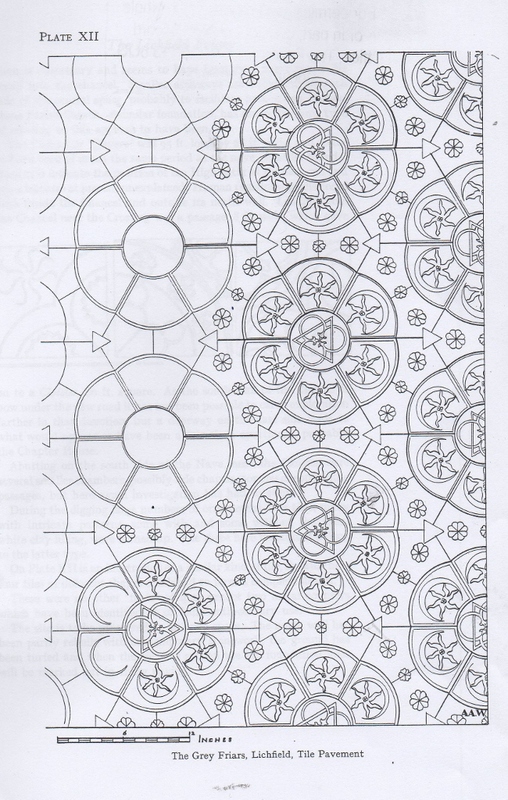 Page 5 had a drawing of some if the exact tiles we had found (the ones that looked like pizzas with the middle cut out) some with patterns, and some without. Note – this is not where the story ends! Lily is having an afternoon on the tiles with Jo Wilson, Lichfield City Council Museum and Heritage Officer and medieval tiles expert, Karen Slade this week, so look out for an update soon. Lily’s doing such a great job – the initial discovery, the ongoing research, and writing it all up afterwards – that I’m thinking of joining the Right Revd Jonathan Gledhill in retirement and leaving Lichfield Lore in her more than capable young hands. 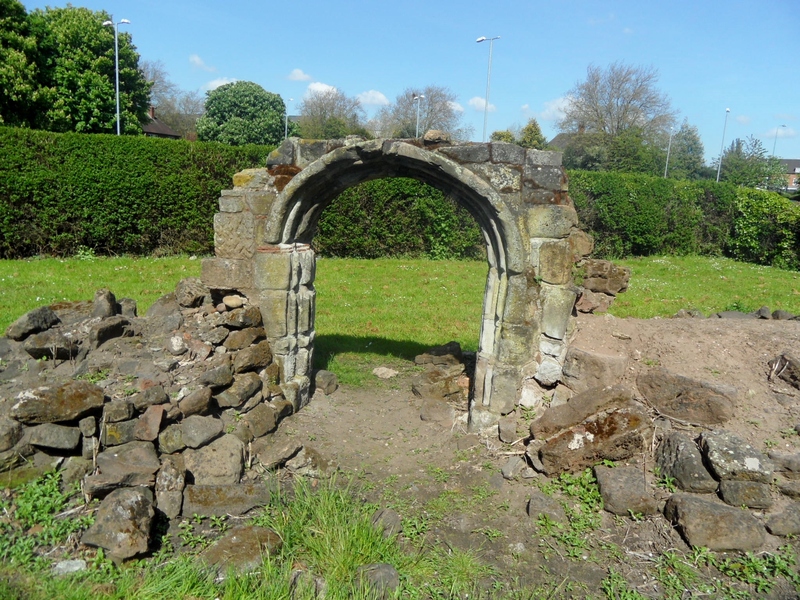 A stone arch stands in the grounds of the Lichfield Campus of South Staffs college and I’ve never been sure whether it is a folly, or part of the Franciscan Friary which once stood on the site. 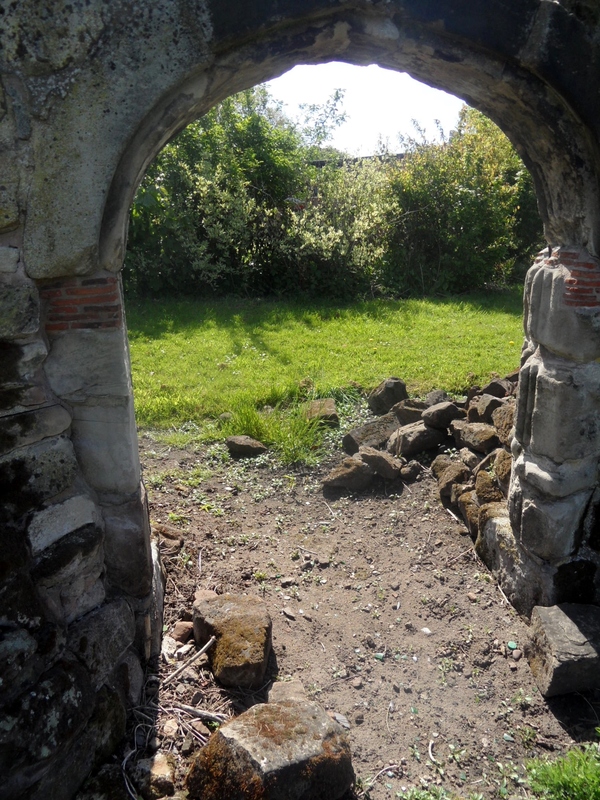 According to a book on the history of the Friary School (1), the arch was discovered in the walls of outbuildings taken down to make way for the new Friary Road in the 1920s. 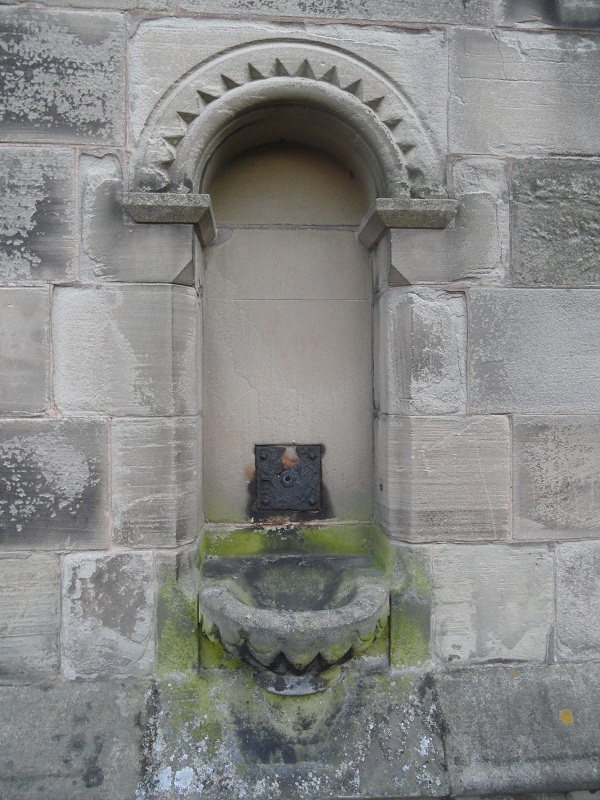 Apparently, it was incorporated into the staff entrance to the school, which used the buildings now occupied by the Library from the 1920s until the 1980s. A former pupil describes the arch as standing on the lacrosse field during her time at the school. Inevitably, over the years the imagination of school children and the history of the site have combined to create legends and stories, including one about a ghostly monk that people are said to have seen passing through the arch. 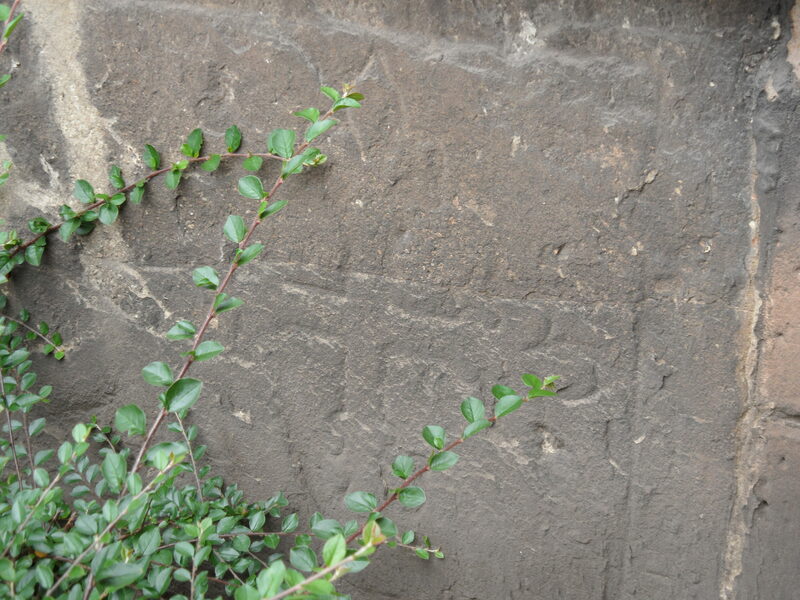 Another intriguing discovery made nearby during the 1920s was the gravestone of Richard the Merchant. 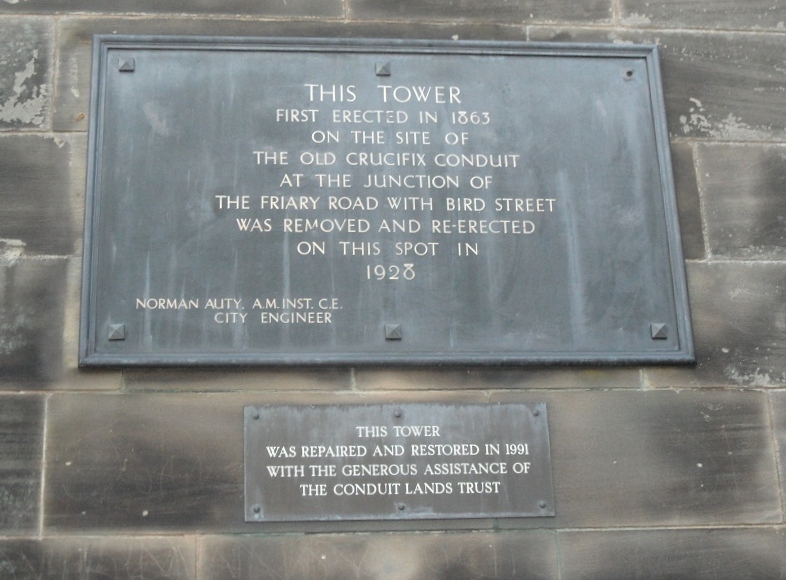 Actually, rediscovery would be a more accurate description, as the stone had first been uncovered in 1746, when a former owner of the Friary was laying the foundations for a garden wall. 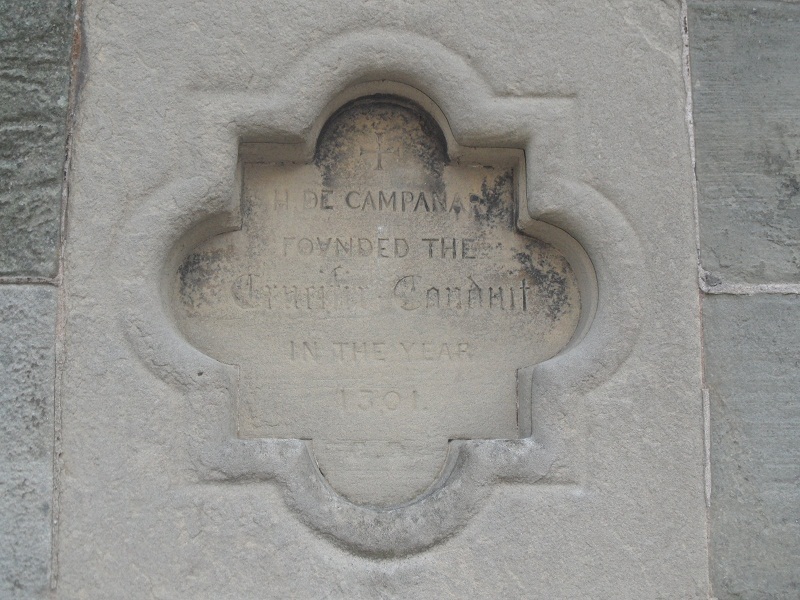 Thankfully, sketches were made of the stone and its inscription as nowadays, its markings can be barely made out and the stone itself is even more hidden away now than when I wrote this post about it back in July 2011. 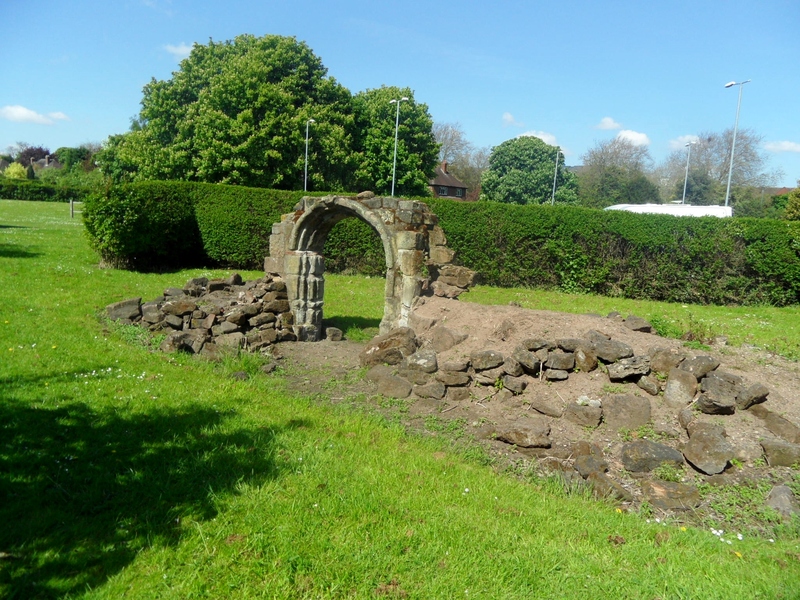 Today I was walking between Dam St and the Bird St car park (which I still call the Woolworth’s car park despite that shop not having been there for years), when I caught a glimpse of what seems to be another arch, over a garden wall which must belong to one of the properties on Dam St. Does anyone have any information on where this arch is from, and why it is here? 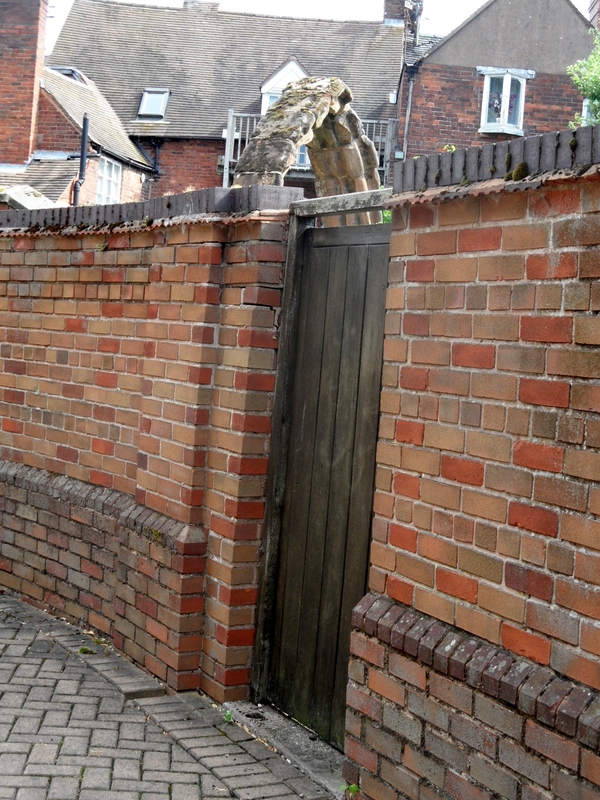 And of course, if anyone has any stories of ghostly Lichfield residents walking through this one, please let us know! (2) I suppose it would actually be a friar, rather than a monk (there is a difference!) but as we’re talking ghost stories here it’s probably not the place to worry too much about historical accurancy! On Monday morning we’ll learn if human remains found beneath a car park in Leicester are those of Richard III, buried in the city’s Greyfriars church after his defeat at Bosworth in 1485. 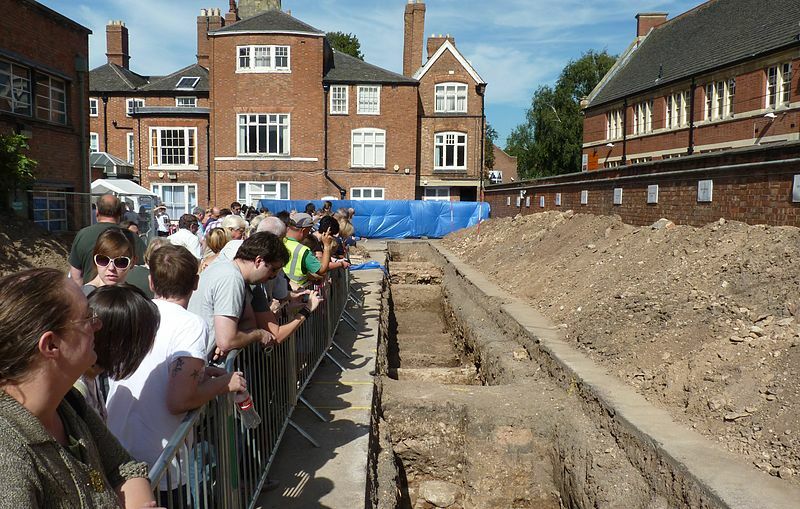 Archaeological Dig Open Day at Greyfriars Leicester. 8th September 2012. Image by RobinLeicester, Wikimedia Commons. Naturally, the possible discovery of England’s lost king has generated a huge amount of interest and last week I had an email from someone in Lichfield who has been doing some background reading on the subject. In trying to find out more about the story of Greyfriars and King Richard III, they found that the Greyfriars were also linked to King Richard II. 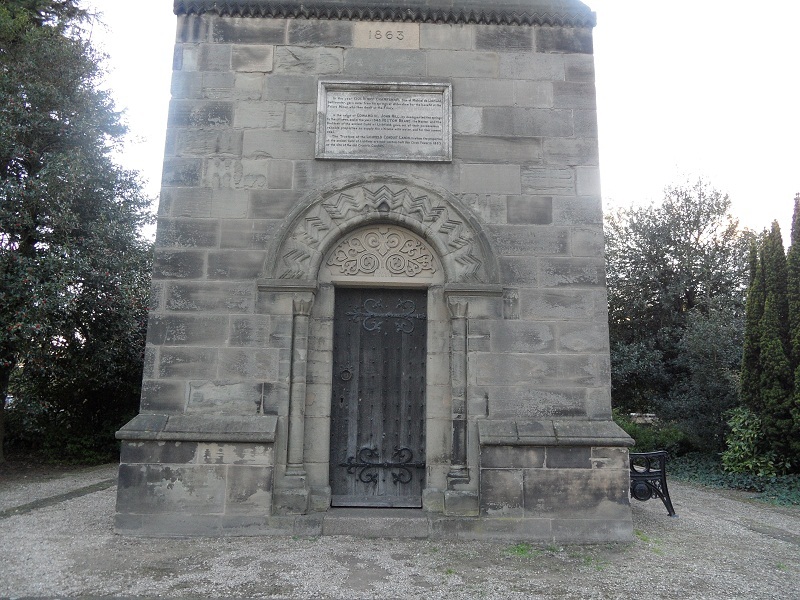 The reason for the email was to see if anyone knew anything more about the role of Lichfield in the story, as per the the following passage from the ‘History of the County of Leicestershire’. The sympathies of the Leicester Franciscans for Richard II brought serious consequences upon the friary in 1402. A Franciscan declared to Henry IV that he and ten other friars of the house at Leicester, together with a master of divinity, had conspired in favour of the deposed Richard. In consequence eight Franciscans of Leicester, with the master of divinity, were arrested and brought to London for trial. The remaining two friars escaped. After two juries had failed to convict, a third jury found the prisoners guilty, and they were executed. Two other Franciscans from Leicester, presumably the two who had at first escaped, were executed at Lichfield about the same time. 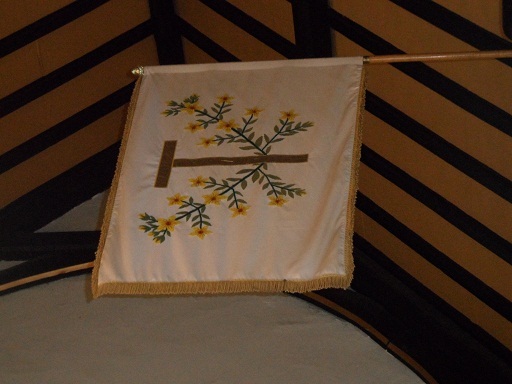 In 1402, at a general chapter of the Franciscans held at Leicester, it was forbidden to any of the Order to speak against the king. 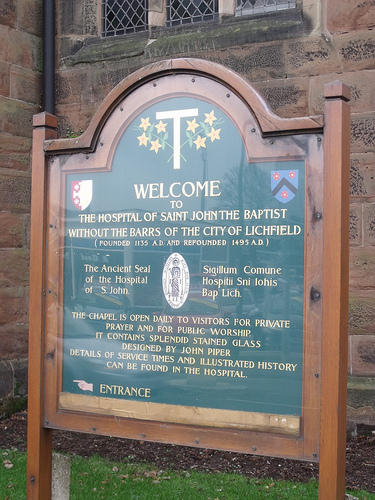 My anonymous correspondent wondered why the friars were executed here in Lichfield? What had brought them here in the first place, and was there any sympathy for them or Richard II amongst the Franciscan population here? 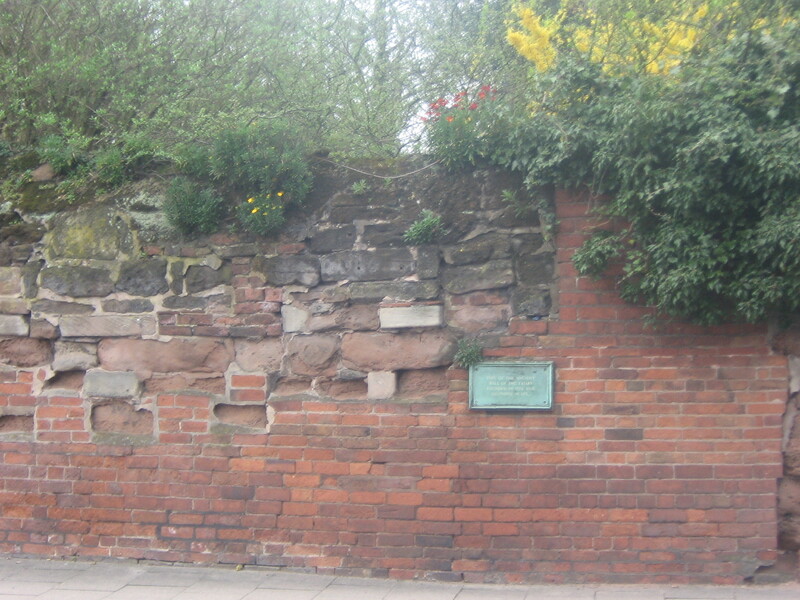 Remains of North Wall of Nave of Lichfield’s Franciscan Friary. Other sources expand on the story a little to tell us that it was Prince Henry, the future Henry V (or at least members of his household) who caught and beheaded the friars at Lichfield. Our own county history tells us that in 1402, Henry IV had ‘ordered knights, squires, and yeomen from various parts of the country to meet him at Lichfield for his campaign against Owain Glyn Dŵr‘. 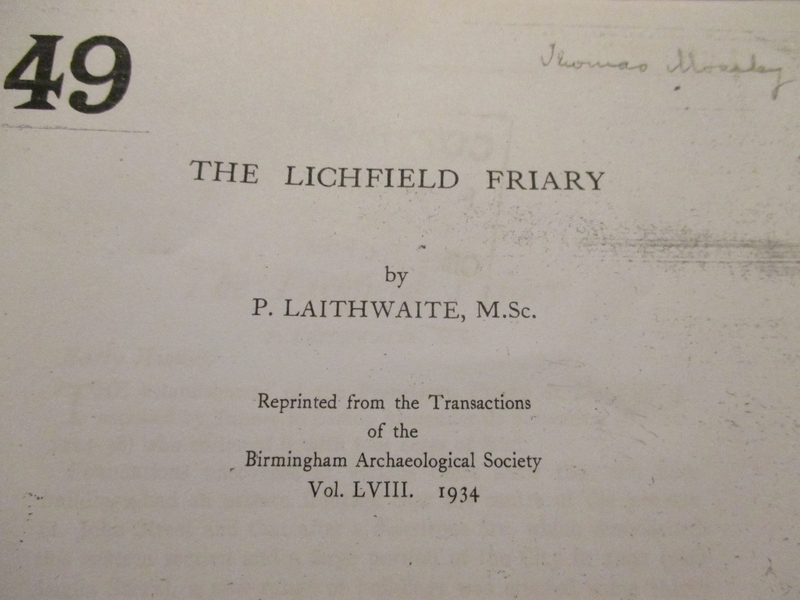 This explains perhaps in part why the friars came to be executed here, but if there’s anyone who can add anything further to this story of fugitive Leicester friars in Lichfield, it’d be great to hear from you. A programme called ‘Richard III:The King in the Car Park’ will be shown on Channel 4 at 9pm on Monday 4th February. 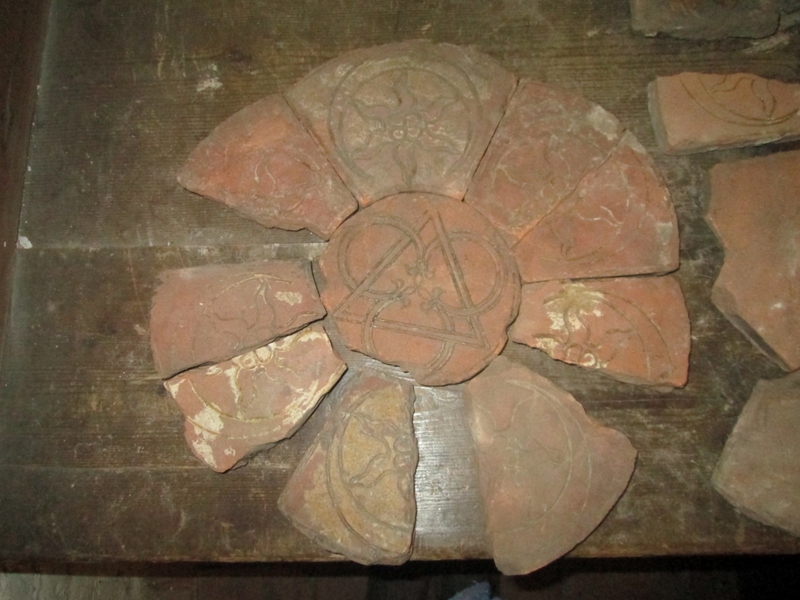 Talking of archaeology digs in car parks, I believe that the report on the Friary Outer is due out anytime now – as far as I’m aware Victorian cellars and medieval pottery were the main discoveries. Of course, everyone knows that if you want to find lost kings in Lichfield, it’s Borrowcop you need to investigate…. Richard II visited Lichfield several times. Most famously he spent Christmas in 1397 at the Bishops Palace, returning to the city two years later as a prisoner of his cousin Henry Bolingbroke, soon to be Henry IV. Edit 4/2/2013 – I probably don’t need to tell you this but it’s been confirmed beyond any reasonable doubt that it is him! King Richard the Third’s remains will now be interred at Leicester Cathedral. I believe there may be a link between this story and Elford too? Happy New Year! A couple of days ago, many of us will have seen in 2013 to the bongs of Big Ben. 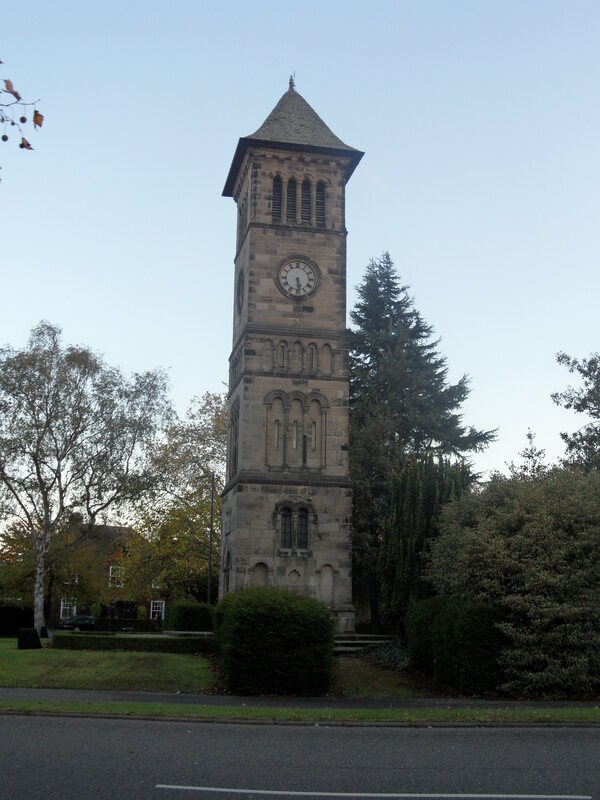 Rather appropriately, Gareth Thomas from Lichfield District Council has found another fantastic document in his treasure trove, relating to our very own clock tower here in Lichfield, said to have been inspired by that famous London landmark. Gareth, in his characteristic generosity, has scanned it on and sent it over for me to share here. A while back I did another post on the Clock Tower (which you can read here), and it’s fantastic when more parts of the jigsaw come to light! I wonder if they did find anything? And if so, did they hand it over?! 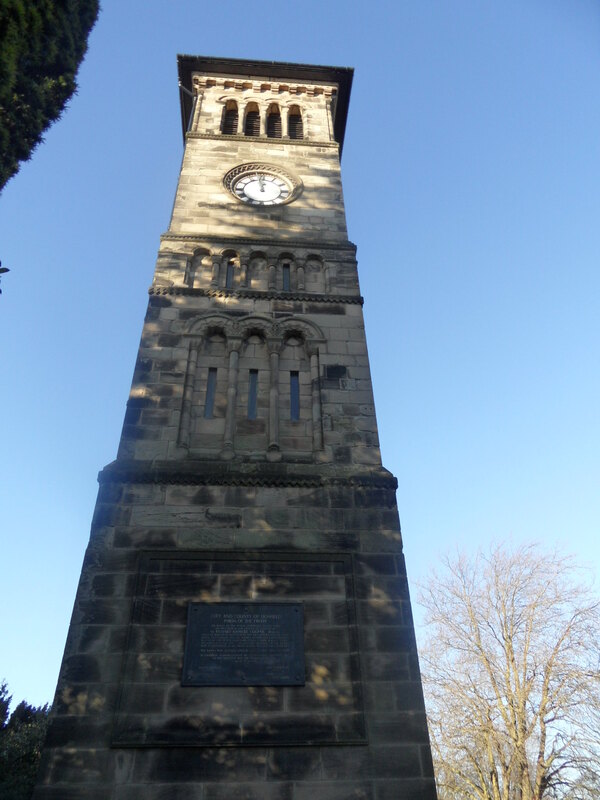 As you may know, the Clock Tower was erected in 1863, making it 150 years old this year. I think it would be fantastic if, as a celebration, we could give people a closer look at the tower that they pass by and the clock that they hear each day, by opening it up to the public (I did go up Birmingham’s ‘Big Brum’ clock tower once so I don’t think it’s too harebrained an idea). Here is a bona fide harebrained idea though – what about starting a new tradition of seeing in the New Year with the bongs of the Lichfield Clock Tower? I wonder if there are any records of people doing this in the past, when we didn’t have Jools Holland on the tellybox to see in the New Year with. Shall we make a date then? New Year’s Eve 2013 in the Festival Gardens. I’ll bring some party poppers….